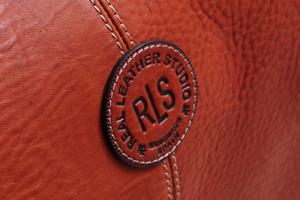 If you are looking for customised products made in high quality leather from Ubrique to do a special present for someone or even with your corporate image, do not hesitate to contact Real Leather Studio. We offer you the possibility of customising all our high quality leather goods even in little details, since you will be able to choose the colour, engrave your name or company logo on it, colour for seam etc. Our main objective is to satisfy our customers. Sample saved in one of our leather golf bags. It can be customized even in the smallest details. 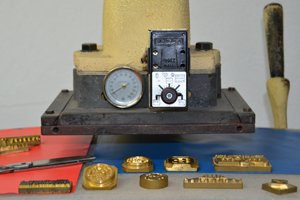 Engraving machine where all our high quality leather goods are customized. This is the final result of the engraved high quality leather good. An exclusive and luxurious leather good. We also attend special orders to create exclusive leather goods. We handmade products for our customers and his/her brand. We work with luxury brands in the world of fashion, interior design, jewellery, etc. Give us your dream, we will make it real. 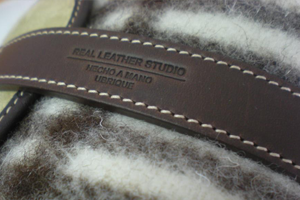 From Real Leather Studio, we want you enjoy of a new concept of handcrafted and customised present, handmade in Ubrique. All our designs can be adapted to society’s needs and we can make real any customised leather good you can imagine. Please, do not hesitate to contact us if you require more information. We would also be very grateful if you could send you opinion to our general mailbox. The image of the product is always important in this global market, this is the reason why its even its container can determine its presentation and makes it even more attractive to the final customer. Taking into account this, our containers or boxes that go with our products can be also customized by including your logo, colour attending to your corporate image, design and size. You can choose the perfect option for the presentation of your leather good. Elegant boxes wthat will make our product even more exclusive.